Chris Paul's favorite shot may not mesh well with the Rockets' gameplan. NBA.com's John Schuhmann gets you ready for the 2017-18 season with a key stat for each team in the league and shows you why it matters. Today, we look at Chris Paul and the Houston Rockets, an experiment in shot selection. After the All-Star break last season, Chris Paul attempted 149 mid-range shots. The Houston Rockets attempted 147. There are a lot of fascinating aspects of Paul's move to Houston, and one is the union of one of the league's best mid-range shooters with a team that has basically eliminated mid-range shots from its offense. Paul has shot 48.0 percent from mid-range (between the paint and the 3-point line) over the last five seasons, the best mark among 117 players with at least 750 mid-range attempts over that time. Last season, he was the only player to shoot 50 percent or better on at least 200 mid-range attempts. Over the last five years, 42 percent of Paul's shots have come from mid-range. He shoots a lot off the dribble and doesn't get to the basket often. The Rockets' meanwhile, have taken just 11 percent of their shots from mid-range over the last five years. That rate hit just eight percent last season and just seven percent after the All-Star break. Built around James Harden, the Rockets' offense is about getting to the line and getting the most efficient shots on the floor. They ranked second in the league in free throw rate last season, when an NBA-record 82 percent of their shots came from the restricted area or 3-point range. Today's best defenses are designed to prevent those shots, though. So there's value in having a guy who take advantage of what the defense gives him. In addition to being an infrequent mid-range shooting team, the Rockets have been a bad mid-range shooting team. Paul will make them better in that regard. And playing alongside Harden, Paul will shoot more off the catch, which means that some of his mid-range shots will turn into 3-pointers. According to SportVU player tracking, 69 percent of pull-up jumpers were 2-point shots, while 78 percent of catch-and-shoot jumpers were 3-point attempts last season. "We did get one of the best mid-range shooters of all time," Rockets GM Daryl Morey told the Houston Chronicle in September. "I think it's good. It helps diversify the offense. "I like scoring more points than the other team. You get more if you shoot threes or layups. It doesn't mean we're going to keep Chris, one of the best mid-range shooters ever, from shooting them." 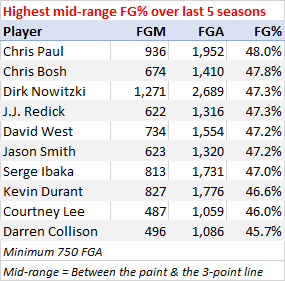 Still, even at a league-best 48.0 percent, those mid-range shots from Paul have been worth less than a point per attempt over the last five years. At 37.9 percent, his threes have been worth 1.14 points per attempt. It's safe to assume that Paul's shot chart will change more than that of his new team. In the Rockets' first two preseason games, Paul hasn't taken a single shot from mid-range. He's 5-for-13 from 3-point range and 1-for-1 in the paint. No matter where the shots come from, Houston has too much talent to not have a top-3 offense for a second straight season. Key stats to know about the Houston Rockets this season. Improvement of 14 wins from 2015-16 ranked second (behind Philadelphia's plus-18), but the Rockets were, statistically, the most improved team in the league last season, 5.5 points per 100 possessions better than they were in '15-16. They had the second biggest jump in offensive efficiency (6.3 points scored per 100 possessions), and were also the league's eighth best team in regard to defensive improvement. With the league average OffRtg jumping 2.3 points per 100 possessions and only four teams allowing fewer points per 100 possessions than they did last season, the Rockets allowed just 0.8 more. Had the best record (13-3) and the best NetRtg (plus-7.3 points per 100 possessions) in the second game of back-to-backs. Took double-digit leads in the first quarter 30 times, most in the league. Went 27-3 in those games. Have ranked in the top seven in pace in seven of the last eight seasons. Last season, the Rockets took 73.1 percent of their shots from the restricted area or 3-point range. This season, they had the league's second biggest increase in percentage of shots from came from the restricted area or 3-point range, leading the league again at 81.9 percent. They set another record for percentage of their shots from 3-point range (46.2 percent) and ranked fourth in percentage of shots that came from the restricted area (35.6 percent). Were 21-0 in the regular season and 2-0 in the playoffs when they shot better than 40 percent from 3-point range. Recorded assists on 62.6 percent of their field goals, the fourth highest rate in the league and up from 58.9 percent (15th) in 2015-16. That was the league's biggest jump in AST/FGM. Only 2.2 percent of their possessions were post-ups, the lowest rate in the league. In each of the last five seasons, they've ranked in the top five in free throw rate and in the bottom 10 in turnover rate. Opponents shot a league-high 66.7 percent in the restricted area and a league-low 37.0 percent from mid-range last season. The Rockets ranked 29th in opponent field goal percentage in the paint (58.7 percent), but third in opponent effective field goal percentage from outside the paint (46.0 percent). Ranked in the bottom 10 in defensive rebounding percentage for the third straight season, but were the third most improved defensive rebounding team after ranking last in 2015-16. Were also the third most improved team in regard to opponent free throw rate, ranking eighth (25.0 opponent free throws for every 100 shots from the field) after ranking 24th (28.9) in '15-16. Ranked 30th in opponent effective field goal percentage in the first quarter (54.9 percent) and fifth in the second quarter (48.9 percent). The Rockets' starting lineup last season – Harden, Patrick Beverley, Trevor Ariza, Ryan Anderson and Clint Capela – scored 122.7 points per 100 possessions, the best mark among 46 lineups that played at least 200 minutes. They took 49.0 percent of their shots from 3-point range, the highest rate (by a wide margin) among the 47 lineups that averaged at least 10 minutes per game in 10 games or more. The starters outscored their opponents by 26.5 points per 100 possessions after the All-Star break, the best mark among lineups that played at least 100 post-break minutes. Ariza and Harden played 2,615 minutes together, the most among any pair of teammates last season. The Rockets' aggregate bench NetRtg (pace-adjusted plus-minus for reserves, weighted by minutes played) was 27.4 points per 100 possessions better in wins (plus-12.1) than it was in losses (minus-15.3). That was the biggest differential in the league. The Clippers allowed 98.5 points per 100 possessions in 1,227 minutes with new Rockets Paul and Luc Mbah a Moute on the floor together, the lowest on-court DefRtg among the league's 250 most-used two-man combinations. After leading the league in corner threes each of the previous three seasons, Trevor Ariza (77) had one fewer than league-leader Klay Thompson (78) last season. According to SportVU, when Ariza was guarding them, opponents scored 5.6 fewer points per 36 minutes than expected. That was the lowest point-prevention rate in the league among players who played at least 40 games. Ryan Anderson had the biggest drop in usage rate (from 24.2 percent to 17.9 percent) among players that played at least 1,000 minutes each of the last two seasons. Anderson had an effective field goal percentage of 61.3 percent on the road and just 47.8 percent at home. That was the biggest road-home effective field goal percentage differential among 205 players who attempted at least 200 shots both at home and on the road. James Harden averaged 29 points, eight rebounds and 11 assists, something that hadn't been done since Oscar Robertson did it 52 years ago. Harden led the league with 723 total minutes of possession and 6.8 pull-up 3-point attempts per game. He also led the league with 11.2 assists per game, 27.1 points created via assists per game, 483 assists on shots in the restricted area, and 368 assists on 3-pointers, 84 more than any player had in a single season prior to this year. He had more than 100 assists to five different teammates. According to SportVU, Harden led the league by using 39.1 ball screens per game. Chris Paul ranked fourth, using 29.4. And their teams each scored 1.17 points per possession when they used a ball screen, rates that ranked third and fourth among the 46 players that used at least 1,000. According to SportVU, Harden threw 7.5 pass-ahead passes (where the ball is passed from the backcourt to the frontcourt, traveling at least 18 feet toward the basket) per game, more than 24 of the other 29 teams, with New Orleans (9.3), Sacramento (8.7), Golden State (8.5), Phoenix (8.4) and San Antonio (7.6) being the exceptions. Harden (27.8 percent) and Anderson (28.3 percent) were two of four players who shot less than 30 percent on at least 50 3-point attempts in the playoffs. Eric Gordon made 133 more 3-pointers than he did the season before. That was the league's biggest increase from 2015-16 to '16-17. His 206 3-pointers off the bench were an NBA record. According to SportVU, Gordon (146), Ariza (122) and Harden (121) ranked third, fourth and fifth (behind Stephen Curry and Thompson) in 3-point attempts in the first six seconds of the shot clock last season. Ariza took 27.6 percent of his shots in the first six seconds of the shot clock. That was the second highest rate (behind only that of former teammate Corey Brewer) among players with at least 300 total field goal attempts. P.J. Tucker had an effective field goal percentage of 63.6 percent in the first 12 seconds of the shot clock and 36.6 percent in the last 12 seconds of the shot clock. That drop-off of 27.0 percentage points was the largest among 284 players with at least 100 attempts in the first 12 and 100 attempts in the last 12. Tucker was one of four players who made at least 25 3-pointers from the left corner and at least 25 from the right corner. NBA TV's Rockets preview premieres at 6:30 p.m. ET on Friday, Oct. 6. See the full preview schedule here.